Limited double vinyl pressing. Expanded edition of this 2012 album from the pop punks. Since forming in the Baltimore suburbs in 2003, All Time Low have become one of the biggest pop-punk bands to emerge on the scene, building a grassroots following of die-hard fans with very little radio airplay and a touring ethic that would rival road-weary vets like Green Day. 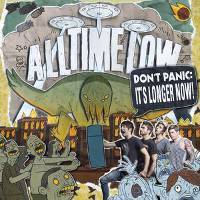 Don't Panic: It's Longer Now! Is a re-issue of the band s fifth full-length studio release, Don't Panic, which debuted at number 6 on the Billboard 200, featuring 4 brand new songs including the hit "A Love Like War (featuring Vic Fuentes) plus four acoustic tracks!